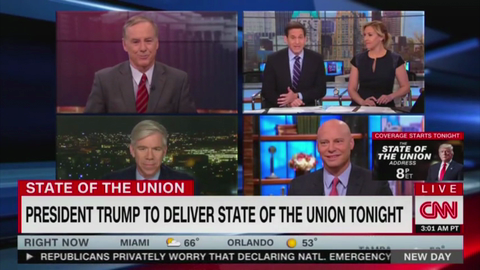 On CNN's New Day, co-host John Berman, before asking former Trump aide Marc Short to report on his conversation with President Trump regarding the SOTU, says: "you are hardly an impartial reporter here." "… they were like death and un-American," President Trump said Monday. President Trump during his first State of the Union address Tuesday night took a dig at NFL players and athletes who kneel during the National Anthem. Senate Majority Leader Mitch McConnell in an interview with Fox News on Tuesday said that 2017 has been "the best year for conservatives" in the last 30 years that he’s been in Washington.